When I stepped inside Beth Abroms’ Washington, DC salon, I noticed two things: an emphasis on curly hair, and fun, lighthearted décor. I worked with Beth to transfer these ideas to the screen, resulting in a vibrant design, well suited to compliment the concise blocks of text used to describe the salon’s services. It’s based on the WordPress framework, which means that when the staff wants to change a service or price, it’s easy altered in ten minutes or less. Fiddleheads is an award-winning salon in Washington, DC. 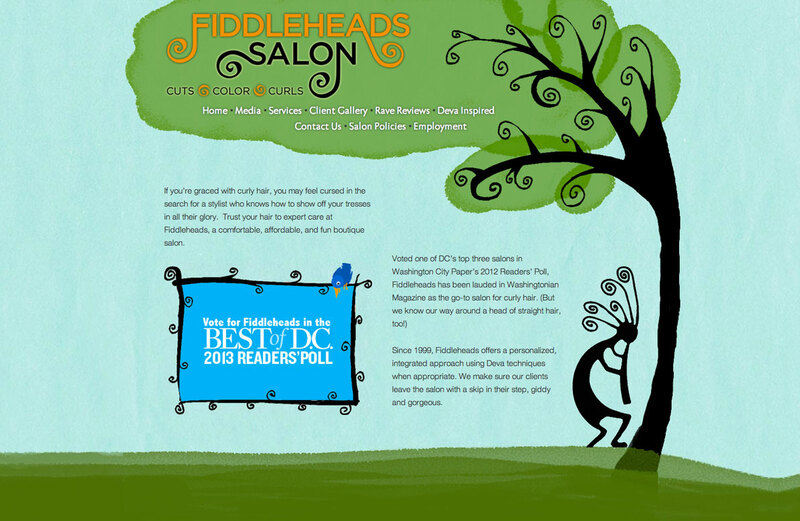 Voted one of DC’s top three salons in Washington City Paper’s 2012 Readers’ Poll, Fiddleheads has been lauded in Washingtonian Magazine as the go-to salon for curly hair. (But we know our way around a head of straight hair, too!) Since 1999, Fiddleheads offers a personalized, integrated approach using Deva techniques when appropriate. We make sure our clients leave the salon with a skip in their step, giddy and gorgeous.